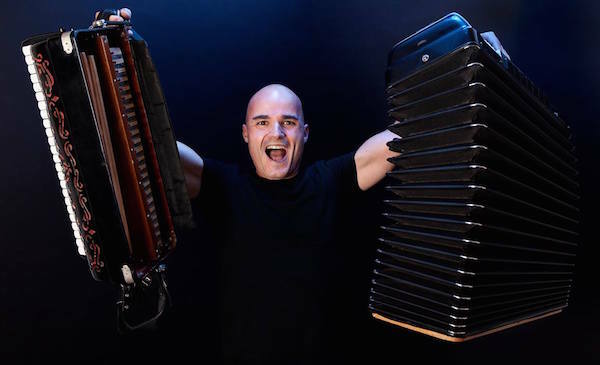 Víctor Prieto, a revolutionary on the accordion, embraces Jazz, Tango, Classical and Celtic Roots enriched with new rhythms and colors. He has performed at many prestigious venues and events such as Berklee Performance Center, Dizzy’s Club Coca-Cola at Jazz at Lincoln Center, Blue Note NY, New Jersey Performance Art Center, Three Rivers Musical Festival, Williamsburg Jazz Festival, Mary D’Angelo Performing Arts Center. He has also performed and recorded with Yo-Yo Ma (Songs of Joy and Peace, Sony BMG Masterworks. “2010 Grammy Winning Album”), Arturo O’Farrill Latin Jazz Orchestra, Billy Hart, Jeff Ballard, Paquito D’Rivera, Matt Wilson, Donny McCaslin, Lionel Louke among others and is involved in projects such as The Maria Schneider Orchestra and Emilio Solla’s Jazz Tango conspiracy. Victor Prieto is a native of Galicia, Spain born in the town of Orense in 1975. At the age of nine Victor was encouraged by his mother to study the accordion-an instrument deeply ingrained in Galician folklore. While studying classical accordion at the Orense Conservatory Victor understood the immense musical potential of his instrument and branched out from the classical education by concurrently taking harmony, arrangement and improvisation classes at Estudio Escola de Musica (Santiago de Compostela, Spain). In 1998 Victor received a scholarship from Berklee College of Music where he majored in performance under the direction of Joanne Brackeen. Berklee, where Victor was the only one to date to specialize in accordion, did not offer any classes focusing on accordion. Uninhibited by these circumstances Victor created his own study program applying the expertise offered by educators at Berklee to the accordion. Victor now lives in New York City dividing his time between performing, teaching and recording. He has recently introduced his third recording, “Chris Cheek and V. Prieto. Rollo-Coaster.”, Cheekus Music. Víctor Prieto Trio at Terraza 7. Thursday February 18th , 2016 at 9:30 pm. No Replies to "Víctor Prieto Trio"